This complete beginner’s guide to decorative stained glass work features 31 step-by-step projects for copper foiled and leaded window panels, candle holders, mirror and picture frames, lightcatchers, and more. Expert methods for cutting and polishing, tracing patterns and soldering are explained with the novice in mind. Lynette Wrigley is a professional stained glass artist and designer with thirty years experience in traditional and contemporary stained glass. As well as undertaking commissions for doors, windows and walls, she has also designed lighting for restaurants, hotels and homes. Lynette works in a variety of applications from leaded windows to decorative panels, individual artworks, sandblasting, painting and fusing. 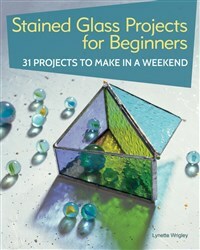 She runs regular stained glass courses for beginners and has authored several books on stained glass technique.